In our online training course An Introduction to AI in HR and the Future of Work, Ian Bailie and Soumyasanto Sen help us break down the hype around artificial intelligence, automation and augmentation and understand the effect it is actually having on HR. In the video below, Ian gives an overview of the four key areas that AI is disrupting and where it’s having the biggest impact on the HR function. There are four areas where we're really seeing AI technology take hold. The first is not surprisingly around experience. Personalised recommendations and the ‘Netflix’ experience has dramatically changed our personal and consumer lives thus altering our expectations. We can translate some of that into the employee and the candidate experience, focusing on how we can use A.I. to really improve the personalisation and the recommendations that both employees and candidates are receiving. The second is around recruitment. With something like recruitment, there are a multitude of different touch points in the process where we can leverage technology or AI to improve the overall experience. Whether it be around the selection or assessment process, AI is having a huge impact. Another way that AI is transforming recruitment is via the use of chatbots. They can be leveraged to better engage with candidates during the hiring process to ensure they stay engaged and informed, allowing organisations to create a positive employer brand. The third is around a learning and development. Similar to the Netflix example, if we're consuming content on a regular basis then we can see platforms learn about our preferences and the types of content that we'd like to see, and again we can create that personalised recommendation. The last is in the area of People Analytics. We have all of this data that we're generating on a daily basis through the use of all of these new platforms, that we can begin to use this data to derive more advanced analytics and really start to be more predictive. These are the four areas that we're looking at when we think about the impact of AI on HR, there is a huge opportunity for. HR to think about implementing AI in their organisations. Is HR ready for AI? As we've also seen there's a huge explosion of technology and new vendors in the market for HR professionals to think about and implement to help with their use cases. However, the big question is, is H.R. really ready? 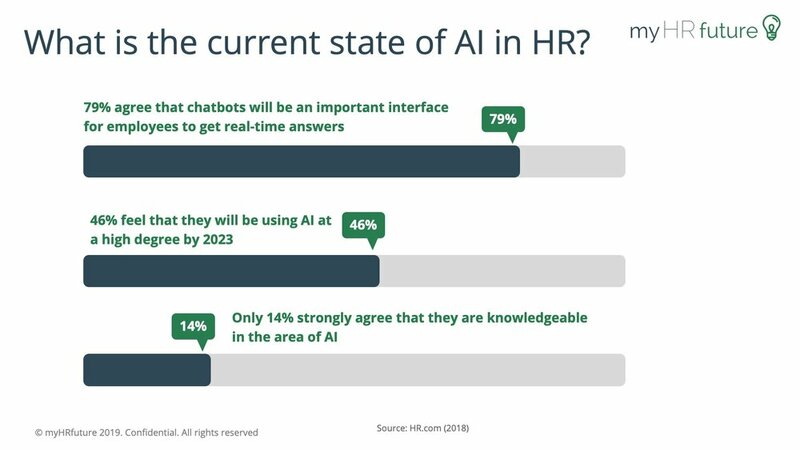 As you can see in Fig.1 above, HR.com ran a survey and they found that nearly 80% of HR professionals felt that they could see a world where chatbots would be answering employee queries. That's perhaps not surprising when you think about how we're becoming more comfortable with chatbots in our consumer lives. However, only 46% felt comfortable with the idea of AI being used to a high degree in the next five years. That is somewhat disappointing but also, maybe reflects how ready HR is to embrace this technology today. Finally, the survey suggests that unfortunately there is a huge number of HR professionals who feel that they're still not knowledgeable in the area of AI. This presents us with a focus area for up-skilling HR to really understand more about this type of technology. It also highlights that as a H.R. profession something we need to consider is how we get to a place where we feel comfortable implementing AI technologies to help with HR use cases. If you’re looking to get started and understand how Artificial Intelligence, automation, augmentation, and the Future of Work are impacting the HR function then this is a great introduction. The objective of this course is to provide you with a solid foundation of what the rise of new vendors incorporating AI and machine learning means to HR and how to consider building such tools into your digital HR strategy. On completing this e-learning module you will become much more fluent in understanding what the impact of AI is on HR and how the Future of Work is impacting all of our lives.